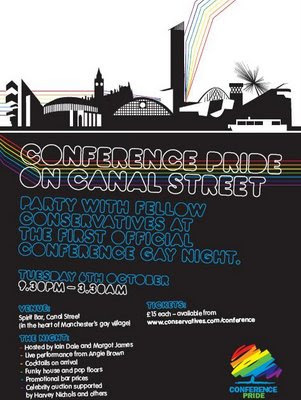 This is a poster promoting a party for gay conservatives in England. Not that there’s anything wrong with that. But that little rainbow tree in the bottom right-hand corner? Yeah. Looks a bit familiar, right? Tory gays, we have a problem. » We are not going to start selling trees on iTunes. Or maybe we are. » Mini-Microsoft says Borg has "turned the corner." » And by the way, guess who’s the next victim of our logo police?